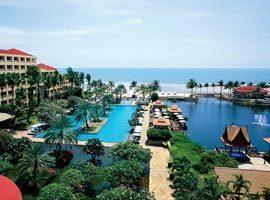 With a small town Asian charm Hua Hin offers a taste of legendary Thai hospitality, rich culture, history and nature. 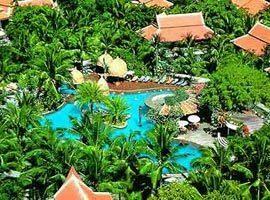 Located on the coast of the Gulf of Thailand approximately 200 kilometers south of Bangkok the former fishing village became the retreat of choice for Thai royalty, upper class society and affluent tourists since 1910. 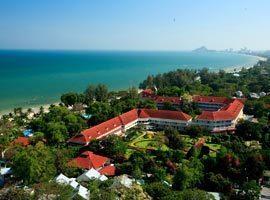 Today, 5 star hotels in Hua Hin reflect this royal status with luxury accommodation and world class facilities along sprawling beaches and rolling hills in the backdrop. Several golf courses, liberating day spas and a plethora of attractions has cemented its reputation as a favorite holiday destination with travelers from around the world. Its 7 km beach shelves slowly making it safe even for children to swim. Add to this curio shops, waterfront restaurants, markets, water sports and good infra structure and its popularity is understandable. 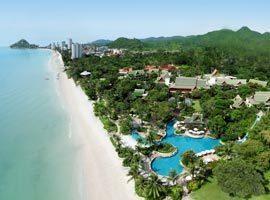 Before booking your accommodation from our list of the top luxury hotels an important consideration is where in Hua Hin to base yourself. If you want to be central to the entertainment featuring nightlife venues, restaurants and bars the location of resorts like The Hilton, Centara Grand and Cape Nidhra are hard to beat. Putahracsa, The Hyatt and Sheraton guarantee tranquil seclusion less than 2 km from entertainment while the private pool villas of The Evason are romantic sanctuaries 20 minutes away. Located in the Takiab area 5 minutes from the centre of the city Amari is walking distance to restaurants and Cicada weekend market. It is ideal for couples and families featuring deluxe ocean facing rooms, a 2 bedroom family suite and kids club. 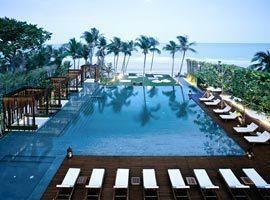 Anantara enjoys a tranquil setting directly on a pristine ribbon of sand. 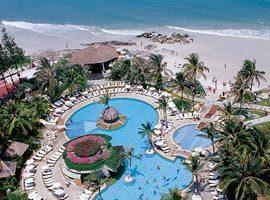 It is moments from entertainment and offers elegant sea view rooms with private balconies extending over the beach. 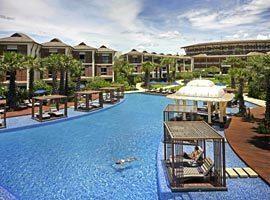 Features a kids club, beachfront pool and spa. 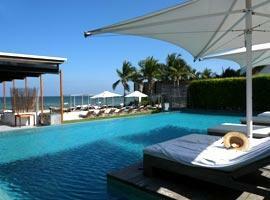 Asara Villas and Suites is located on a beach which is as close to private as they come. Settling in a tropical garden complete with ponds and fountains it offers seaside pools and private pool villa accommodation including a 2 bedroom pool villa. Black Lotus is conveniently near town facilities and offers jacuzzi spa suites as well as the ideal family accommodation with private pool villas featuring 2, 3 and 4 bedrooms. Facilities include a fitness centre, spa and restaurant. 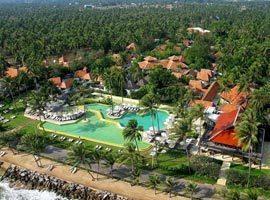 Cape Nidhra is the best romantic hotel for couples with an ideal location on the beach and opposite the night market. All villas have their own pool and sundeck allowing you to relax in privacy. There are also 2 bedroom family suites. Colonial style historical grace and a great place to stay for families offering a kids club and 2 bedroom duplex suite, but also for a romantic holiday in an intimate pool suite. Located steps from markets, restaurants and nightlife. This award winning small luxury boutique hotel with a private beach is romantic and located 10 minutes from the city centre. Its charming beach villas and seaside deluxe rooms offer exceptional views and a touch of elegant old world charm. With an enormous beachfront pool featuring private salas and flanked by an ornamental lake, ponds and tropical gardens the setting is a travel magazine picture come to life. The location is secluded, yet only 10 minutes from entertainment. 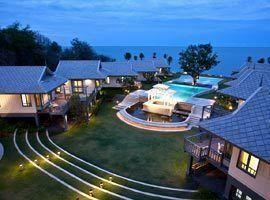 With a seaside setting surrounded by tropical gardens and lotus ponds Evason is 20 minutes outside Hua Hin near Pranburi. 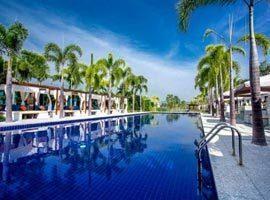 It offers not only 5 star accommodation in luxury pool villas, but is also one of the top spa resorts in the area. This towering land mark offers the best vantage point to enjoy unobstructed ocean views from rooms with large private balconies. 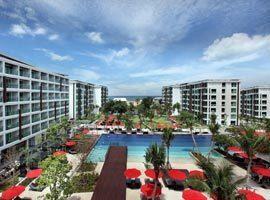 It is near entertainment, walking distance from markets, restaurants, nightlife and right on the beach. Located on a prime stretch of an endless beach Hyatt Regency sports an ideal blissfully serene location while the city's amenities are moments away. The tasteful rooms and suites has a natural flow to the tropical outdoors. InterContinental puts you in a privileged location near markets and restaurants with a sublime beachfront stretching for miles. Dinners are enjoyed in breathtaking settings and a pool bar serves drinks in private poolside salas. 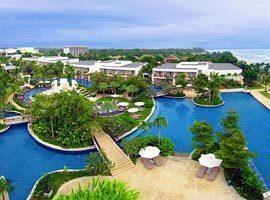 Based on all but faultless guest reviews a stay at this beach resort guarantees to maximize your holiday experience. 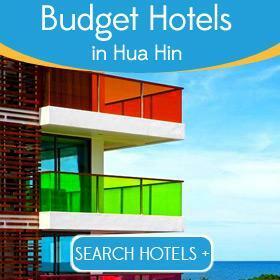 It is chic and trendy and it has a great seaside location. A striking feature is the 120 meter pool fronting each guest room. Putahracsa is another of our best resorts for couples who prefer privacy while still being near nightlife entertainment, shops and markets. 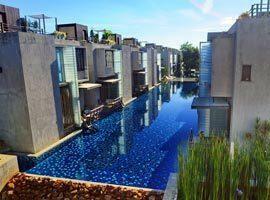 It offers spacious villas with either your own Jacuzzi or your own pool set in a private garden. Sheraton is a great family friendly hotel featuring a kids club with a range of entertainment programs as well as deluxe rooms with inter-connecting facilities. A 4 600 square meter pool, fitness centre and spa are some other facilities.